We have no idea what anyone would want with a Volkswagen Touareg hood without the rest of the car attached to it but that's the premise of a promotion the automaker is doing as a benefit for Feed the Children. 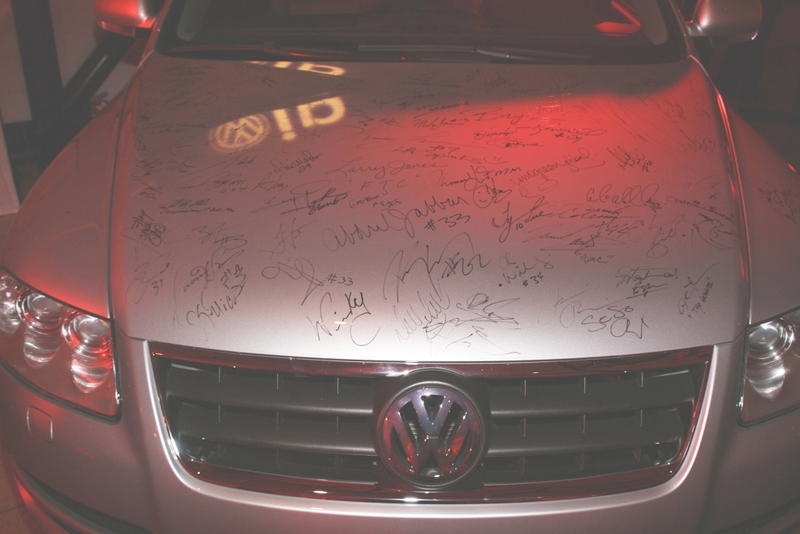 Volkswagen will auction off two Touareg hoods that were signed by 40 athletes, musicians and actors during a Las Vegas Volkswagen Important People promotion in Las Vegas February 16-18 and during the National Basketball Players' Association Gala February 17. The auction began yesterday with minimum bids set at $500. Sadly, neither of the bids (one, two) have seen any action yet which, again, begs the question...who wants a hood without the car even if it does have a bunch of celeb signatures. Despite that, we have no doubt the hoods will eventually be scooped up. I think the reason the hoods will sell is because people believe that celebrity memerobelia will be worth more money than they pay in the long haul.